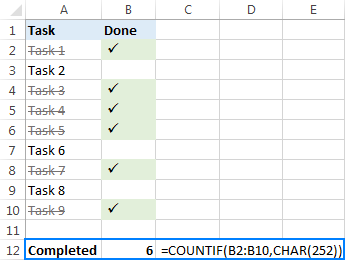 The tutorial shows six different ways to insert a tick in Excel and explains how to format and count cells containing checkmarks. 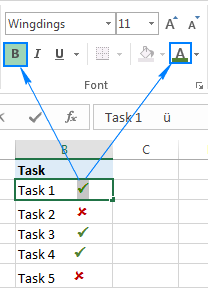 There are two kinds of checkmarks in Excel - interactive checkbox and tick symbol. A tick box, also known as checkbox or checkmark box, is a special control that allows you to select or deselect an option, i.e. check or uncheck a tick box, by clicking on it with the mouse. 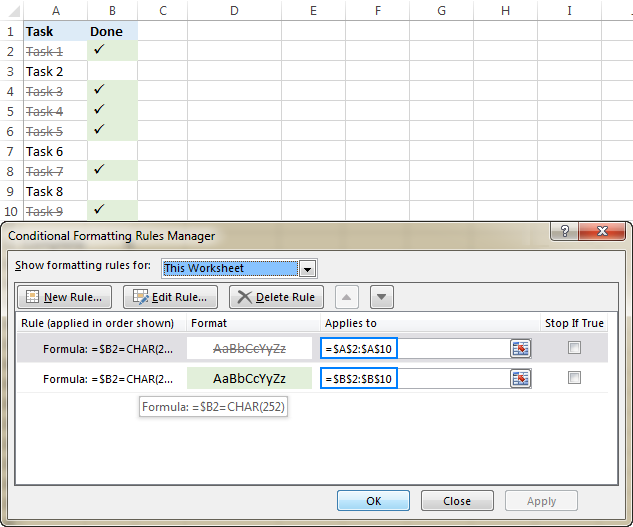 If you are looking for this kind of functionality, please see How to insert checkbox in Excel. A tick symbol, also referred to as check symbol or check mark, is a special symbol (✓) that can be inserted in a cell (alone or in combination with any other characters) to express the concept "yes", for example "yes, this answer is correct" or "yes, this option applies to me". Sometimes, the cross mark (x) is also used for this purpose, but more often it indicates incorrectness or failure. There are a handful of different ways to insert a tick symbol in Excel, and further on in this tutorial you will find the detailed description of each method. All of the techniques are quick, easy, and work for all versions of Microsoft Excel 2016, Excel 2013, Excel 2010, Excel 2007 and lower. Select a cell where you want to insert a checkmark. Go to the Insert tab > Symbols group, and click Symbol. 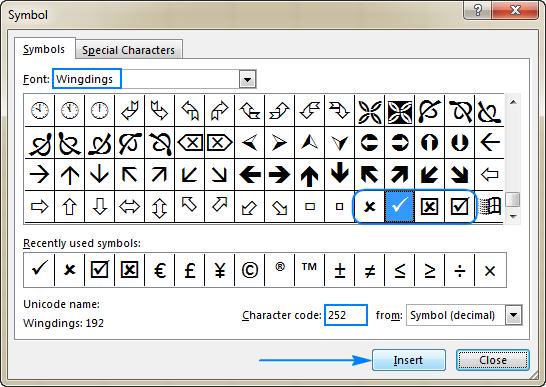 In the Symbol dialog box, on the Symbols tab, click the drop-down arrow next to the Font box, and select Wingdings. A couple of checkmark and cross symbols can be found at the bottom of the list. Select the symbol of your choosing, and click Insert. Finally, click Close to close the Symbol window. Tip. As soon as you've selected a certain symbol in the Symbol dialog window, Excel will display its code in the Character code box at the bottom. For example, the character code of the tick symbol (✓) is 252, as shown in the screenshot above. Knowing this code, you can easily write a formula to insert a check symbol in Excel or count tick marks in a selected range. Perhaps it's not a conventional way to add a tick or cross symbol in Excel, but if you love working with formulas, it may become your favorite one. Obviously, this method can only be used for inserting a tick in an empty cell. Note. For the tick and cross symbols to be displayed correctly, the Wingdings font should be applied to the formula cells. One you've inserted a formula in one cell, you can swiftly copy a tick to other cells like you usually copy formulas in Excel. Tip. To get rid of the formulas, use the Paste Special feature to replace them with values: select the formula cell(s), press Ctrl+C to copy it, right-click the selected cell(s), and then click Paste Special > Values. Select the cell where you want to put a tick. Press and hold ALT while typing one of the following character codes on the numeric keypad. As you may have noticed, the character codes are the same as the codes we used in the CHAR formulas but for leading zeros. Note. For the character codes to work, make sure NUM LOCK is on, and use the numerical keypad rather than the numbers at the top of the keyboard. Insert the desired check symbol in a cell using any of the techniques described above. Select the symbol in the formula bar and press Ctrl+C to copy it. Don't be discouraged by the appearance of the symbol in the formula bar, even if it looks differently from what you see in the screenshot above, it just means that you inserted a tick symbol using another character code. Tip. 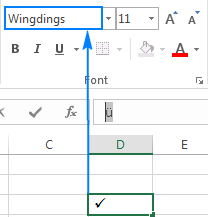 Look at the Font box and make a good note of the font theme (Wingdings in this example), as you will need it later when "auto-inserting" a tick in other cells. In the Replace box, type a word or phrase that you want to associate with the check symbol, e.g. "tickmark". In the With box, press Ctrl+V to paste the symbol that you copied in the formula bar. 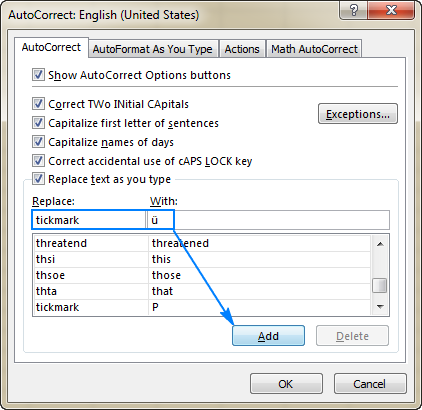 Click Add, and then click OK to close the AutoCorrect dialog window. Type the word that you linked with the checkmark ("tickmark" in this example), and press Enter. The symbol ü (or some other symbol that you copied from the formula bar) will appear in a cell. To turn it into an Excel tick symbol, apply the appropriate font to the cell (Wingdings in our case). 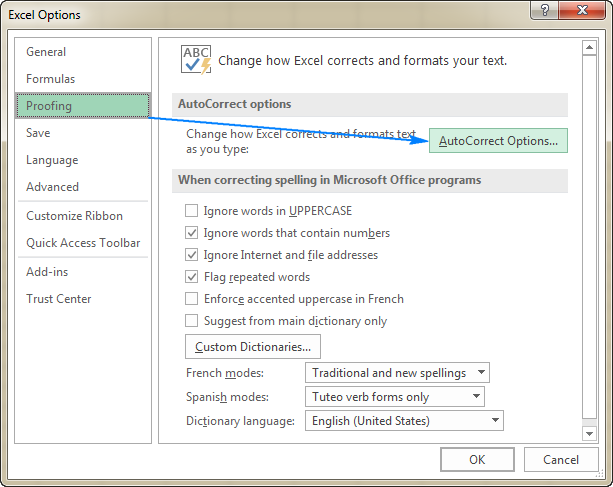 The beauty of this method is that you have to configure the AutoCorrect option only once, and from now on Excel will be adding a tick for you automatically every time you type the associated word in a cell. If you are going to print out your Excel file and want to add some exquisite check symbol to it, you can copy an image of that check symbol from an external source and paste it into the sheet. For example, you can highlight one of the tick marks or cross marks below, press Crl + C to copy it, then open your worksheet, select the place where you want to put a tick, and press Ctrl+V to paste it. Alternatively, right-click a tick mark, and then click "Save image as…" to save it on your computer. Now that you know how to insert a tick in Excel, you may want to apply some formatting to it, or count cells containing the checkmarks. All that can be easily done as well. 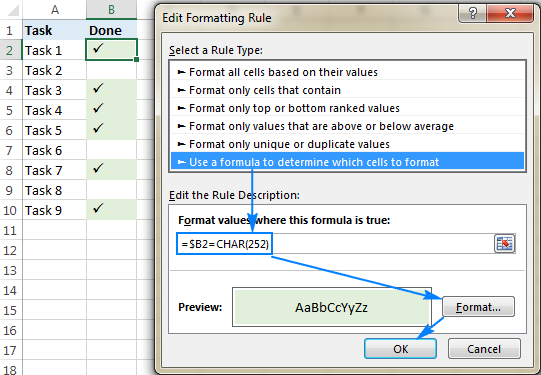 If your cells do not contain any data other than a tick mark, you can create a conditional formatting rule that will apply the desired format to those cell automatically. A big advantage of this approach is that you will not have to re-format the cells manually when you delete a tick symbol. Select the cells that you want to format (B2:B10 in this example). Where B2 is the topmost cells that can potentially contain a tick, and 252 is the character code of the tick symbol inserted in your sheet. Click on the Format button, choose the desired formatting style, and click OK. Note. This formatting technique works only for the tick symbols with a known character code (added via the Symbol command, CHAR function, or Character code). Where B2:B10 is the range where you want to count check marks, and 252 is the check symbol's character code. As is the case with conditional formatting, the above formula can only handle tick symbols with a specific character code, and works for cells that do not contain any data other than a check symbol. If you use Excel tick boxes (checkboxes) rather than tick symbols, you can count the selected (checked) ones by linking check boxes to cells, and then counting the number of TRUE values in the linked cells. The detailed steps with formula examples can be found here: How to make a checklist with data summary. This is how you can insert, format and count tick symbols in Excel. No rocket science, huh? :) If you also want to learn how to make a tick box in Excel, be sure to check out the following resources. I thank you for reading and hope to see you on our blog next week. 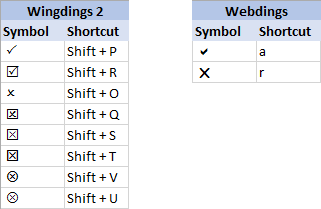 24 Responses to "6 ways to insert a tick symbol and cross mark in Excel"
I see all you are very supportive, Pls help to solve this. i want when i enter 1,2,3..... in a box my below mention results from above data shows to me, is it possible??? I need to make a tick mark or check mark that consists of dots. In other words the check is made with small dots (a broken line). Do you have any suggestions? Please try to use the "=UNICHAR(57612)" symbol with "Segoe UI Symbol" font. I really appreciate your support in this thread. If I have inserted a lot of symbols, what is the easiest way to remove or delete these symbols. For now have to remove 1 by by. I need to check anyone of those two columns. If one is checked user should not be able to check/tick other sub-column. That two columns should accept only tick symbol. since the checkboxes don't exclude one another by default, you will most likely need to use some VBA code. Feel free to ask around MR Excel forum for that. You can also try to modify this one for your needs. I am not getting proper symbols of tick mark and cross. I am getting P and O in validation drop down list. How to remove tick from the excel? Like any other character, a tick symbol can be deleted with the Delete key. If it is a checkbox you want to remove, then click on the checkbox while holding the Ctrl key to select it, and then press Delete. So glad. This site is very useful. So I understand how to make the check in the boxes however what if it is a box I am wanting someone to fill out. Can someone simply click the box for it to check? Or would they have to go to insert? In case you are using the Check Box control, then of course check boxes can be ticked off and cleared by simply clicking the box. How do I link tick box cells (Which I have set up and the cell with text in also turns green when i tick the tick box) But what I'm trying to do is link that to a cell at the end with "C" & "D" in thumbs up or down. So when all the boxes are ticked I get the thumbs up!.